Deep from within the bowels of the cave comes a cute fluffy rabbit. Hopping over rocks and prancing it's way toward the lights. Little does one know that this rabbit is the most foul, cruel, rodent that you've ever laid eyes on! 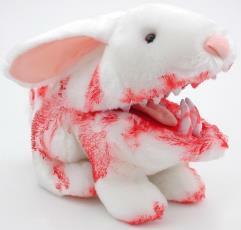 Fresh from an age old exclusive, being offered to the general public for the very first time, comes the Bloody Rabbit with Big Pointy Teeth!